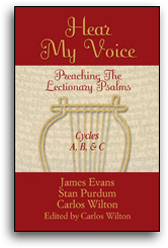 This psalm, titled "A Song Of Victory," has rich associations in Christian liturgy. Portions of it occur in all three lectionary cycles for Palm Sunday (Liturgy Of The Palms), as well as in all three cycles for Easter Day. The reason for the Palm Sunday connection is plain to see: "Open to me the gates of righteousness, that I may enter through them and give thanks to the Lord" (v. 19).